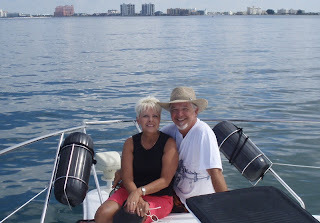 Also known as Boss and Byshka, we're parents, grandparents and boat owners setting out on a sea bound adventure from Sanford, Fl close to Orlando on the St. Johs's river. 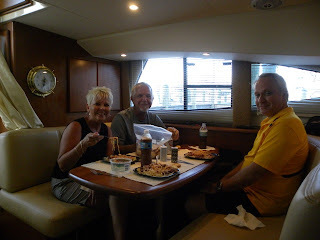 We will be cruising 140 miles up to Jacksonville then down past Miami through the Keys and up the Gulf of Mexico to Clearwater, FL with Candy's borther Dusty and Sisten-in-law Corinne. Join us as we set sail for a wild week of boating! The final leg of our journey was a short 3 hours but AMAZING. Another major treat of the trip is the following video of dolphins that we picked up just minutes before turning into Clearwater Pass. They were so playful! It is a good sailing omen to have dolphins run with you like this. No doubt we have been and are blessed. What a way to end a trip! We noticed the dolphins as we were taking photos of our arrival. Here are Dusty and Corinne as we are approaching Clearwater Pass. Candy and I were next. You might be able to pick out the fin behind us. We jumped up and started the video as they ran along the bow. 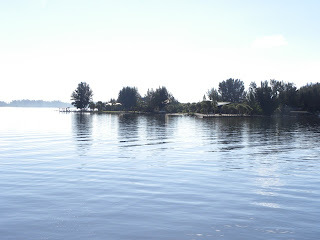 In the video and pics you can also see why they call Clearwater, Clearwater and what a beautiful day it was with calm waters and sunny skies. The following picture shows us motoring through Clearwater Pass (thanks to John Vafiadis a friend of ours who was kind enough to meet us and take the pics). The twin condo towers behind us are where we would come for the many years we have lived away from Clearwater and rent a condo in one of the buildings for a month in the summer. Family and friends would come to visit us rather than us toting the kids around. It was a great. Here we are, arriving at the temporary slip at our condo on Island Estates, Clearwater Beach. A man in our building who owns the slip graciously allowed up to use it for the next week as ours is prepared to recieve BossSea. 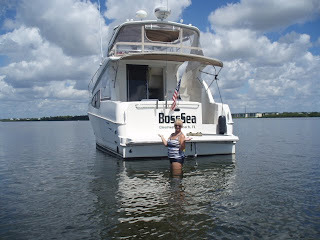 And finally, BossSea in her temporary slip next to our friend John's boat. A long trip, yes, but we all noted how quickly it passed. Books were taken but never read because of the beauty. We were blessed to be able to spend wonderful time with Dusty and Corinne and will cherish the memories forever. Thanks for being a part of it with us. It is good to be home and a blessing to have experienced what we did over the past week. I hope all who read this blog have enjoyed it and in the process gained a new appreciation for the state of Florida. We certainly have! Richard, Candy, Dusty and Corinne! Friday dawned beautifully in Ft. Myers. We made a later than usual start since we were feeling pretty good about ourselves having come all the way from Islamorada the day before and with problems in the process. First order of business was fill the tanks since we got in after Moss Marina had closed. (By the way these are very friendly and accomodating people - highly recommended). After filling the tank I needed to pay. 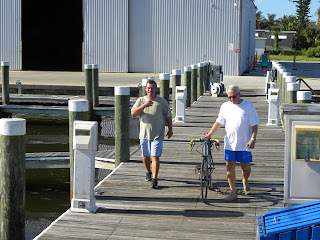 Unfortunately the Marina office was quite a walk but there was a bicycle right there at the fuel dock. How thoughtful and convenient! I rode the bike to the office to pay only to be chased down by the boater who owned the bike, thinking I was stealing it. First off, I wouldn't do that. Second, who would steal that wreck?! (And Moss Marine SHOULD keep a bike at the fuel doc. That seems very thoughtful to me. ) 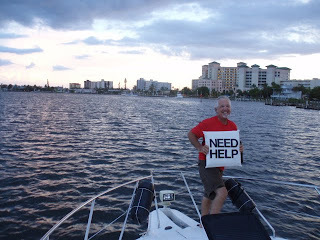 Anyway, Smokey wasn't called, we all had a good laugh, I paid and we left Moss Marina, Estero Island, Ft. Myers beach bound for points North. 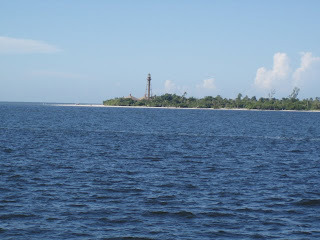 Turning the point at Ft. Myers Beach to cross the mouth of Charlotte harbor and go under the bridge to enter the Intracoastal Waterway the Sanibel Point lighthouse comes immediately into view. Beautiful in the morning sun! My comment on departure was that we would be irresponsible to miss the opportunity to travel the Intracoastal on this stretch. 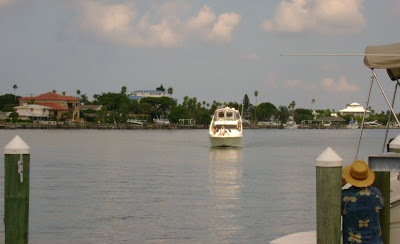 Passing behind Sanibel, Captiva, North Captiva, Cayo Costa, Boca Grande and other beautiful barrier islands is a treal enjoyed by too few people. The sea life was thick. We passed a small boat circling in the channel with a passenger leaning over the edge petting the Dolphins running along side their boat. How cool is that? The stretch from the mouth of Charlotte Harbor at Ft. Myers to above Boca Grande pass is as pretty as anything we have seen so far. THAT is saying something! BossSea is running great. I finally figured how to trim her for best performance. We are running along at 23mph, the wind is fresh and cooling and all is right with the world from our vantage point. As we approach the next set of markers there is a sign. As I strain to read it (being the only person on the deck watching the water) I manage to steer left as the channel truns about 30 degrees to the right. Ever wonder what a 19,000 lb boat feels like as it runs aground at 23mph? It would take too long to write the description. Suffice it to say it is a gut wrenching, alarming and somewhat violent event. What is it they say about crashing a plane? It isn't the crash so much as the very sudden stop. The similarities between boating and flying planes is eerie and in this case true. Dusty, laying in the front berth taking a break managed to twist his knee as he was wrapped up in a sheet. 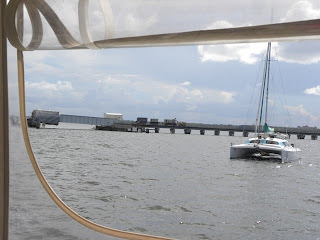 (We did notice a nose print on the mirror over the berth that wasn't there before!) Poor guy. Everyone wanted to know what happened. How was I going to tell them that I plowed the boat into about 2 feet of sea grass and muck? They figured it out on their own and were a gracious bunch. So there we were, run agound, not able to move. The props were dug in enough to kill the engine when put in gear. How does such an event look? Well.....anyone who knows Candy knows she does not have long legs...and she is standing in a deep spot! To steal a phrase, "who ya gonna call?" TowBoat US! TowBoatUS is like AAA on the water. If you own a boat in Florida coastal waters but aren't a member with them or SeaTow you are certifiably crazy. Fortunately I had purchased an unlimited membership. The financial consequences of having not done so would make the gas bill for the trip look like chump change. So there we were, just beyond Red Marker 21 (the turn I missed) glued to the grass and muck at the bottom of Lemon Bay. It is always good to find humor in even the most challenging things. A quick call on Channel 16 to TowBoatUS and they had a great guy, Captain George, on the way from Englewood. He arrived at the boat within 30 minutes. He said he thought the paperwork would take longer than freeing us. About 3 hours later, yes 3 hours of constant churning and pulling, he had managed to work us loose. THAT was an experience! An he too was gracious reminding me that in these parts there are two types of boaters, those who have run aground and those who will. I felt better and don't feel the need to ever do that again! Dusty, being the type to eagerly walk through doors that get opened to him, did some fishing as we waited for the tow boat and managed to land a nice size snook. Too bad the telephoto wasn't on zoom, it was a nice fish. We baked in the sun from around noon to 3pm while Captain George shallowed out a bowl under the boat with his tow boat engine. With much coaxing he managed to pull us free. Then the question. What was bent or broken? Remember, 19,000 pounds x 23mph = a lot of momentum! Fortunately, everything seemed to work fine. Dusty dove under the boat to check the props and rudders. Looked good. We were underway but physically and mentally exhausted. 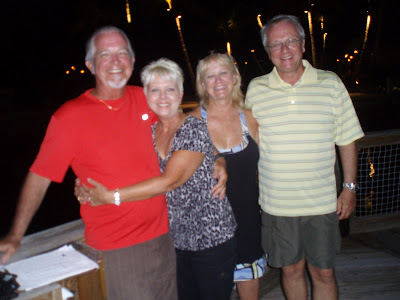 While planning to make Sarasota or even Clearwater before the side trip to the sand bar, we decided to stay the night in Venice, FL at the Crow's Nest Marina and Restaurant, right in the mouth of Venice Inlet. This is some 25 miles from Sarasota. We fueled up, showered and had dinner in their fantastic restaurant. As we finished dinner the sun was setting at Venice Beach. 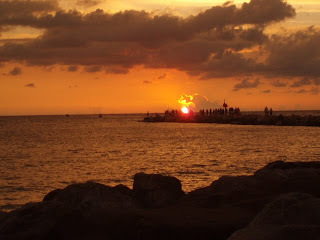 Corinne took this beautiful shot right at sunset over Venice Inlet. Look what we would have missed if I had been more responsible! We set out in the morning for Clearwater (again). 63 statute miles, roughy 3 hours and we are there. (We won't be taking the Intracoastal. (I am not likely to run aground out in the Gulf.) The next challenge is that our slip is not ready. We are supposed to have a temporary berth ready across Mandalay Channel from our place. The specifics of that aren't yet finalized with the company that was supposed to have our slip at the condo prepared to receive us. Who knows what tomorrow will bring? Live life to its fullest today and be glad! Day 6 – Running on fumes and BANG, WHAP, SCREECH. What was that! Buzz, buzz. Some of the most challenging days start so beautifully. Our morning departure from La Siesta Marina, Islamorada, FL started with this peaceful view from the TIKI deck at the Marina. How do you top buying gas in South Beach and arriving in the Keys to swim with Manatees? Well, you don’t. Departure from our secluded marina at 8:45am was as beautiful (and less eventful) as our arrival. 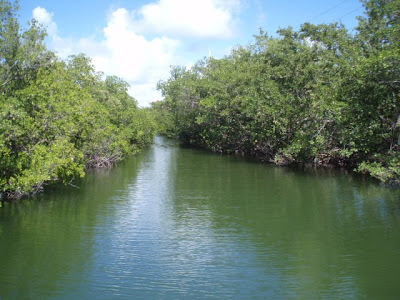 Look at this channel through the mangroves to get back to the main channel. So cool. 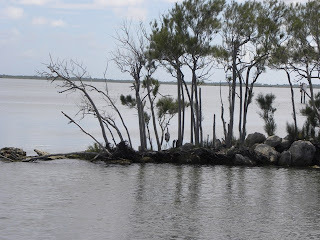 Striking out on this southern Florida end of the Intracoastal Waterway was a beautiful mixture of amazing watercolors and interesting sights including boundary signs for the Everglade. 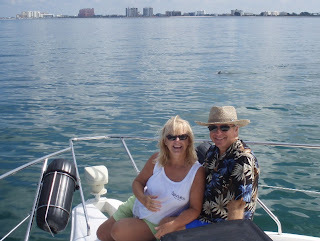 We ran along the Keys for about 5 miles to pick up the Yacht Channel (yep, that’s what they call it) North. As we proceed, our emerald green and blue water turns tan with stirred up sand. Dusty tells me it is from Bone Fish that stir up the bottom sand to get to their food. It’s an interesting sight and makes one want to grab a fishing pole and have some fun. But we’ve got water to plow so on North we push. If you look at a map of Florida you will notice a vast stretch of isolated shoreline and water from East Cape, which is Everglades shoreline where the eastern side of the state ends, moving up the West coast of the Everglades toward Marco Island. 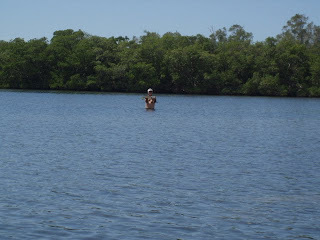 There is a whole lot of nothing out there except Everglades mangrove barriers and skinny, skinny water. There are 3 useable ports: Flamingo, Chockaloskee and Everglades City. To stay away from the shallows and make reasonable time North, the route takes you well off shore, well out of sight of any land…for several hours and far away from these ports. Our fuel burn is still higher than it should be. That will be checked in Clearwater. It has implications, however, on a long cross water leg that goes well off shore with no convenient fuel stop. Past the Flamingo channel - which is a 20 plus mile round trip run into Flamingo from our direct course across this section of the Gulf of Mexico - there is no practical place to stop to get fuel or service since any trip to the East, given the way the shoreline curves around, would take as long as going on to Marco Island. That is the implications part; take the time and burn the fuel to go buy more fuel at Flamingo or press on? We press on. Dusty bought 2 five gallon gas cans at the Bass Pro Shop (it’s called something else in Islamorada, but it is the same thing and owned by Bass Pro Shops) the night before. He needed them for his boat and figured we could fill them and have some insurance in case we run short. Let’s see, fuel burn is 32 gph at speed; ten gallons - that should get us………nowhere! Well not really, at 1200 rpm we could do something like 20 miles on 10 gallons. So we are feeling pretty good as we pass the Flamingo cut off with just over a half tank of fuel. The Gulf of Mexico along this direct stretch from Flamingo to Cape Romano just South of Marco Island is lonely mid-week. With somewhat shallow water in every direction except the channel, one can see how a bad storm would make for some nasty, nasty waves. This is no place to be stranded. It is beautiful, in a standing on the edge of a cliff in the Grand Canyon kind of way. Calculating fuel burn and watching the GPS Chart Plotter for course and route information is a favorite past time on this leg. Candy and Corinne went to sleep and I was wishing I could. By my calculations we would get to Marco about the time the fuel ran out. It made for a tense time. The short story is, we had maybe 20 minutes of useable fuel in the tanks when we tanked up in Marco. At Marco I got approached by Smokey in a boat with this blue lights blazing and him fussing at me for making wake. Good grief man, if you knew what we had just been through you would be escorting us into the fuel docks with lights and siren blaring telling everyone what outstanding sailors we are. (I shouldn’t have made the disparaging comments about our Paul Blart, Mall Cop experience in Boca Raton. It came back to haunt me.) No ticket though so no harm, no foul. 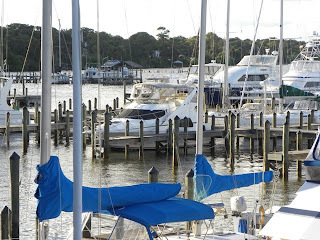 We stopped at the Marco River Marina. They weren’t particularly friendly either. I think people on Marco Island, given how isolated it is, just don’t want other people around. No problem. After fueling and waiting out a thunderstorm we were off for Ft. Myers. About half way to Ft. Myers is when it happened. BANG! Screech! Oh good grief, what was that! Well it didn’t take long from the smell and the buzz, buzz, buzz coming from the panel alarm to figure out that we had shredded a serpentine drive belt which powers the cooling water pickup, water pump, etc. Man, a big engine sure heats up fast when you turn off the water! Three miles off shore drifting away from land with the only useful channels 20 miles ahead or back and it’s 6pm. Hmmm. Not good. It could be worse, but not good. Fortunately I had included a new belt along with the fuel filters and other things in our emergency travel kit. 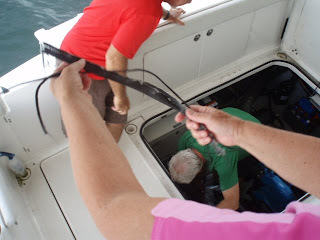 We were able to replace the belt and replace the antifreeze that boiled out of the heat exchanger into the engine bilge when the engine overheated. There was a job for everyone. 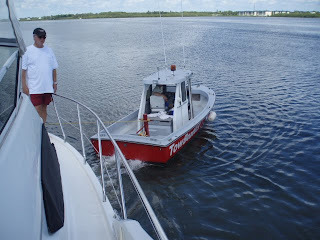 Candy manned the helm starting and turning off the engine as we refilled the heat exchanger. Corinne and Dusty helped jury rig a coolant refilling apparatus (Silverton folks should be shot for where they put the coolant reservoir). My job? Standing between two hot, running engines to replace the belt and hold the hose as we refilled the heat exchanger. Within 45 minutes we were underway. We made our Marina at Ft. Myers Beach at dusk. By the time we tied off it was dark….and the Marina was closed. Fortunately, thanks to the marvel of cell phone technology we had called ahead. They left a key to their Boaters Lounge where there was a TV, showers, a laundry, etc, etc. Nice evening, nice place. We set out this morning for Clearwater. We may make it tonight or we may stop in Sarasota or Longboat Key. Seems the girls want to go shopping at St. Armand’s Key. That even sounds like fun to me but we’ll see. I’m starting to get “get home-it is”. Day Five - Boca Raton to Islamorada in the Keys. Manatees, Scorpions and boating mistakes, Oh My! A trip like ours is most often about the trip itself, not the destination. Today was different. 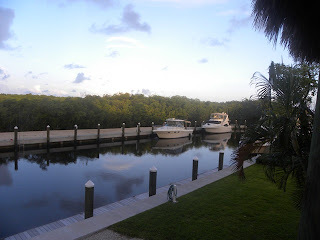 Our arrival in Islamorada and location made the whole trip, every last gallon of it (no, I am not over that part!) worth it...Big Time. The pictures and video below tell most amazing part of the story which included Dusty being stung by a black scorpion and Candy and Corinne swiming with Manatees. But first, our departure from Boca Raton. The day started well with coffee on the bridge, until a very suspicious security guard came slowly sauntering by. This was a tall, thin African American version of Paul Blart, Mall Cop (if you saw the movie you know what I mean. If not, the name pretty much says it all!) Anyway, he comes s-l-o-w-l-y walking by and dips his head to his left shoulder. You know the move, you've watched the TV show "Bad Boy, Bad Boy, Whatca Gonna Do When They Come For You, Bad Boy". It's that patented Cop move where they speak into their shoulder, or more specifically the microphone clipped to their shoulder and talk with someone in dispatch. Well, he did it about me! Listen fella, I'm no Bernie Madhoff here! Humble as BossSea may be, I bought her with my own money! Who you talkin' about there Smokey wanna be?! 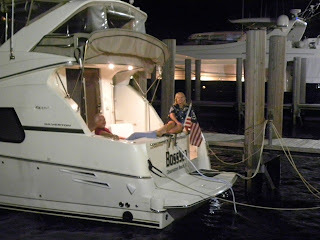 I promptly got off the boat and went up to him waving my resort card with BossSea's name on it next to the word YACHT. So there! He was nice, acting non-chalant and all like he was just talkin' trash to the front desk clerk. But I know better...or maybe I was a bit overractive since he had just come on his shift at 7am and we had arrived after he left the day before. Must have been that inadequacy thing going for me at that moment. Anyway, we got ready quickly and left the slip at 7:20am knowing we needed to clear the El Camino Real bridge which was next to the resort. Of course, they didn't have a sign posted for opening times so we figured they all open either on the hour, half hour or quarter hour so 7:30 would be perfect. NOT! That dad burn bridge was the only one we ever came across that opens every 20 minutes, at 00, 20 and 40 minutes past the hour. And we missed it! We pulled out of the slip at exactly 7:20 called the bridge on the radio and she said we missed our chance. Another 20 minutes of going in circles, this time in front of the Boca Raton Resort with Paul Blart over there thinking he missed his one big chance at Resort fame by nabbing squatters. Ha! Take THAT! Through the bridge we motored past more rediculously beautiful houses through an exceptionally long no wake zone and came upon a bridge opening to the Atlantic. One quick decision later we were following a million dollar private fishing boat out through a trecherous channel past a sunken boat that a crane was attenpting to raise and out into the Atlantic, again. We could not take another several hours of bridge opening and waiting, we'd rather take our chances with the sea. And THAT was our best decision of the trip so far! 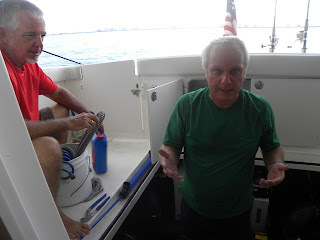 Sea conditions were near perfect and we found that ideal combination of speed and trim that allowed BossSea to ride comfortably past Port Everglads at Ft. Lauderdale, where the big cruise ship port is located and on down to Miami where we stopped for fuel to make our run to Islamorada. 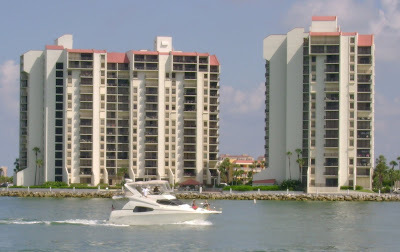 There wasn't much to see or take pictures of other than previously over-priced oceanfront condominiums that all look alike from the water most anyplace in the world. 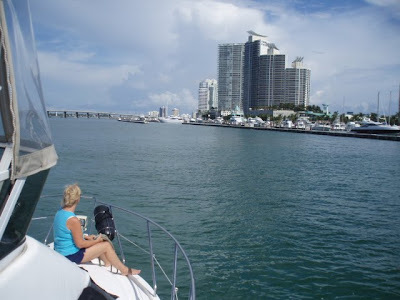 We made great time to the Miami Beach Marina at South Beach where we fueled up, looked around for the CSI folks (I figured Paul Blart had called ahead) then departed Government Cut, the main shipping channel for Miami, and out to sea for a 4 hour run to Islamorada. 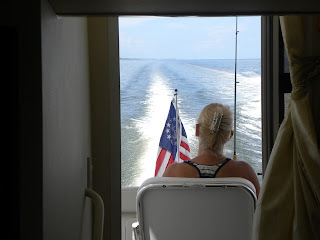 There was even less to see on that part of the trip since we stayed in Hawks Channel, an ocean highway between Miami and Key West, which runs far enough off shore to avoid reefs on both the Port and Starboard sides of the boat. It is a very wide and safe passage and once again BossSea performed flawlessly. 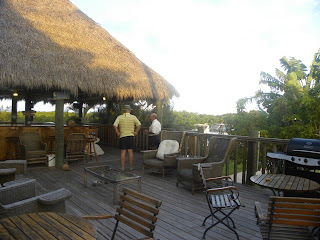 The real treat and experiences came as we started our arrival into Islamorada. 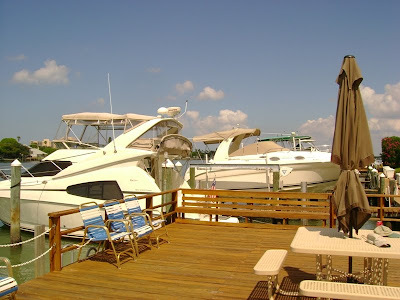 We had called ahead and arranged to stay at La Siesta Marina on the bay side. Ray, the dockmaster gave me very specific directions. 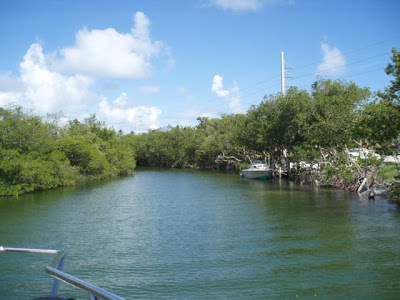 Follow the private channel along A1A to Joe's Fish Shack and their channel would be the first channel past Joe's which wound through Mangroves into their very private marina. We navigated through some very skinny water; being as clear as glass it was looking far more shallow than the 2.8 feet on the depth meter - we draw 2.9 feet but kicked up no mud. There was Joe's , a 1950's place that is closed and looks like it hasn't been touched since the 50's and there was the channel right into the mangroves like Ray said so past Joe's we go. And YIKES! 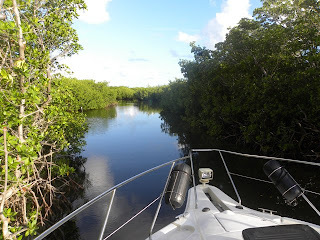 this is a blind channel that dead ends with Mangrove nearly brushing both sides of the boat and no way out but back. Backing this boat up isn't that big a deal unless you PANIC then all bets are off. I had Dusty shouting "look out for the stumps", Candy and Corinne freaking out about the old broken down boat I am about to back into and I am pulling off this deft 180 degree turn with the stern inches from the wreck behind us and bow pulpit inches from the mangrove. Nothing to it. Thanks Captain Wes for the training! Out we go, follow Ray's directions to the letter and in we go to most beautiful secluded marina I have ever seen. On the way back from dinner, walking down a dark gravel road to the marina it happened. Dusty yowled and almost went down to his knees immediately. Being born and raised in Florida and through all of his years in the islands, including years now with IsleGo, http://www.islego.com/ , he had never been stung by a Scorpion. Another first for this trip! I gallantly mushed it and Dusty went back the next morning to cronicle its resting place with his cell phone camera. The ants were already having a field day. Sweet revenge. The treat on arrival earlier in the evening was the highlight of the trip so far. A Manatee and her new born calf came up to us after we tied off. They were beautiful...so serene! Today was a great day, an exhausting day, a frustrating day and a fantastic evening all rolled into one. I must say the sights and experiences are starting to blend together which makes blogging it so very helpful. It would be a shame to have all of this mushed up into a general experience remembering only the very highest points, of which there actually were more than a few. How th is day started is important but most important was how it finished which is what I cover first here. The real treat came after we decided to push to make Boca Raton once we arrived at Palm Beach. 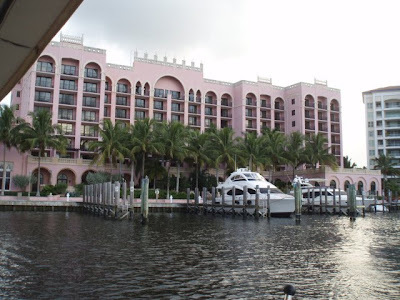 Looking at our cruise book we decided to call the Boca Raton Resort and Club to see if they would take a transient. If you know about these parts you know there are two places to see and be seen in Boca Raton, The Breakers and the Boca Resort and Club. The Yacht Basin lady was so very pleasant and helpful over the phone, taking our credit card information since we would arrive late. "Does your boat exceed 100 feet?" she asked, to which I responded if you lay it end to end three times, it does. I guess I caught her on a good day. Around 75 bucks and we got the full run of the place. This was originally the Ritz-Carlton Boca Raton back in the day, and I mean back in the 20's, and is now part of the Waldorf collection. It is beautiful; you know, the kind of place were all the walls have pictures of rich dead people doing fun stuff 80 years ago. 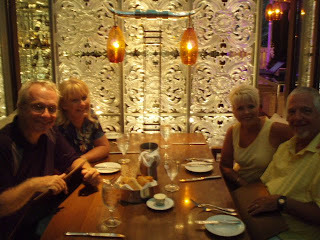 You've got to go to their site and look the place over http://www.bocaresort.com/ Their pictures barely do it justice. And the four of us stayed there for about $80. The Yacht basin lady very apologetically told me it would cost a little over $2 per foot to park the boat (their stayovers are usually much longer and don't stay on the boat.) But we did! The funny thing is I could have parked the boat lengthwise in the WIDTH of the slip! Our Yacht Basin bretheren were, well, bigger that we were; generallly about 3X our size. My thought was BossSea looked like what happens when the other boats spawn. The boat in the background was easily 100 feet and beautiful! You can see in the second pic that it was a humbling place to park. Candy couldn't resist the bathing beauty pose. It works for me! If you will notice, the Lazzara in the background, which might normallly look smaller because it is further away still looks like a ship, not a boat. Well....it was. Beautiful. you can see here too that our blue slip mate was...biggish! Stinky and sweaty we immediately walked right up to the swanky-est steak restaurant they had and proceed to have an amazing feast as we talked about what a tiring day it was on the Polo grounds. 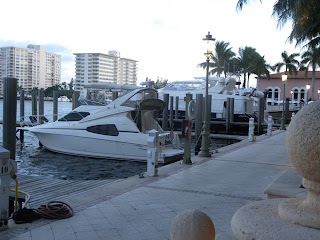 Well, not really but it was fun to give them our resort charge cards that listed BossSea in the Yacht basin. Heh, heh, little did they know that BossSea looked more like what got spawned from the 100 footers on either side of us! This day actually started off in Cocoa with beautiful weather. 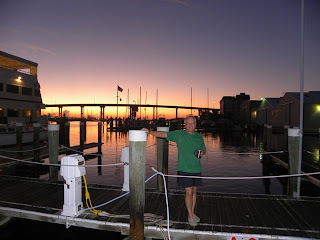 We needed to stop for fuel right away because of the late arrival in Cocoa the night before and the fact that the marina where we stayed did not have fuel pumps. Am I ever glad they didn't because it required us to make a stop for fuel in what turned out to be one of the most beautiful "everyday" places just 10 miles or so South of Cocoa. This picture shows the cove into which we motored to fill the tanks at a great little marina. I say it is everyday beauty because it is everywhere around us in this amazing part of the state. A picture of the cove shows the calm beauty in the early morning hours today. The thing that keeps going through my mind is, I thought I knew Florida. Candy is a native, we were married here and spent our first 10 years together in the state. I graduated from the Univ. of So. Florida in Tampa, etc, etc. Anyone who has ever known us has known that no matter where we have lived, and that includes Tennessee, Georiga, Florida, California, Wisconsin (and Minnesota by default) and now almost 20 years in Missouri, that we have always considered Florida "home". But I and so many others have never really seen Florida like we are seeing it on this trip. After departing Cocoa and proceeding once again through some of the most beautiful National Seashore areas North of Vero Beach, we cleared Vero by about noon. I couldn't soak in enough of the beauty of the place. Central Florida, Disney and the likes, is not Florida, THIS is Florida. 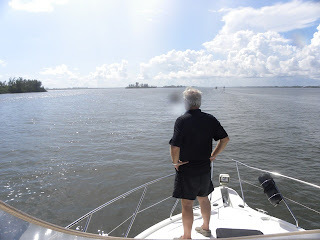 We made Sebastian Inlet on the Intracoastal quicker than we thought. This is where one would normally cut across the state through the Ocheechobee Waterway across lake Ocheechobee and out into the Gulf at Ft. Myers. I called the Corp of Engineers this morning to see if the Waterway was open yet. (As I mentioned before it has been closed all summer for lock construction). Well, they said it will likely open Thursday, maybe even Wednesday. Sounded like Fools Gold to me so we continued South. Only, we made a mistake and decided to go out through Sebastial Inlet and take the "outside" route again (as if the St. Augustine run on Sunday wasn't enough of a lesson.) I now know that BossSea is not an ocean going boat. She is too short. There is not question though that she will make a great coastal cruiser on the Gulf coast. After an hour and a half of pounding and fighting to keep the boat planed and tracking straight in southeasterly swells, we re-entered the Intracoastal route through Ft. Worth Inlet at Palm Beach. It was there that we began to experience bridge opening Hell! There is no way to time the many low bridges to make it to them at the right time to allow opening either on the hour and half hour or on the quarter and three quarter hour. Bridge tenders, bless their hearts, they for that brief moment of time every 30 minutes while the rest of us just endure. I like the open on command stuff type on the St. Johns. Now THAT was the way it was meant to be. I think they get more sophisticated on the coast and decided to aggravate both the boater and driver. Figures. The good news is that during the hanging around waitin' on the bridge to open blues we called the Boca Raton Resort and Club and decided to push to Boca. Pushing to Boca was one reason the blog didn't get posted at the end of the day. The other was the fantastic dinner, amazing amenities, nice swim in the pool, etc as previously described. What can I say? It was all about us after four days on the water after enduring bridge roulette! As it turned out, the next morning started out with a bridge flashback and went up hill from there. 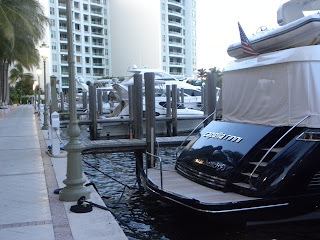 It was a fantastic day going from Boca Raton to Islamorada in the Keys by way of South Beach Miami, as noted in the following blog. Day Three continued (and finished) - We made it to Cocoa, baby! Immediately after posting the previous blog the railroad bridge started to rise - one hour before posted on the sign nailed to the bridge. There were several boats waiting and everyone was calling the Coast Guard, Railroad office, NASA, you name it. The guy in the catamaran charged the bridge in his dingy fussing to high heaven about the ridiculous hours that apparently even the Coast Guard was not aware of. Well, it worked, apparently, since the workers decided to leave one hour early and raised the bridge. This is how it is supposed to be at all times unless a train is coming. Before we got to this point we passed through some of the most beautiful and pristine grasslands and marshes I have ever seen. In the process we saw several Manatees and there were Dolphins everywhere. Manatees are way to fast (well, not fast) but on top water so briefly that one cannot focus and shoot fast enough with a digital camera. This is a simply amazing part of Florida. You can really only see it by boat. It is a National Seashore South of New Symrna Beach that extends toward Merritt Island and Cape Canaveral, far beyond the point one can drive. The body of water formed by this spit of land is called Mosquito Lagoon. "Haulover Canal" joins Mosquito Lagoon to the Indian River, all part of the Intracoastal Waterway. 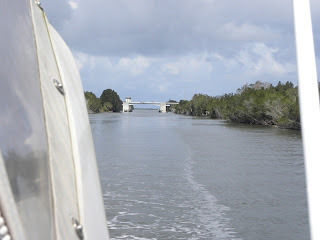 Haulover Canal, shown here, is narrow and deep through which very large barges pass, along with boats of all sizes. We just missed a barge that came through and passed us before we went into the canal. This was only a few miles before the railroad bridge fiasco. Coming out of Haulover Canal this sight was beautiful and characteristic of the nature we have enjoyed throughout the trip. There are parts where the water is wide open and we get to run along at speed. At those times it is easy to find a comfortable seat with a beautiful view and do a little reading as seen here. Candy looks pretty comfortable. 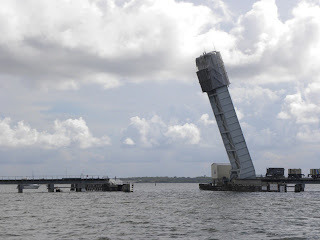 After we passed the railroad bridge then five miles further waited 15min for the Cape Canaveral Causeway Bridge to open we ran along behind Cape Canaveral with the Shuttle Vehicle Assembly Building beaming in the afternoon sun. With binoculars we could see the shuttle launch pad three miles further East but it was impossible to get a good shot from the moving boat. The space shuttle landed today on the back of a 747 but we were unaware of it and missed the show! 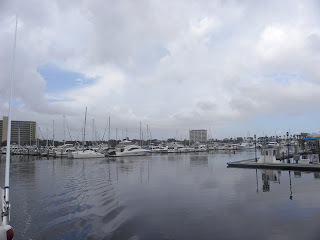 We finally made Cocoa and pulled into the small but nice Cocoa Village Marina. Here is BossSea nestled comfortably in her slip. This was a tricky mooring with breezes picking up and very, very narrow passages including 90 degree turns past large expensive boats. If they only knew how little experience I have doing that my guess is they wouldn't have allowed us in! We made it though with no bumps, dings or boo-boos. Now we just need to get out in the morning! Somehow I missed lunch but Corinne and Candy made up for it with a great spaghetti dinner. Tomorrow starts early, hopefully; we're looking to depart no later than 7:30. Not sure how far we will get but likely Lake Worth or further South. We'll see. The good news is that we expect to finish day four at least half way to our destination. As much as I look forward to the Keys I sure would like to cut across Lake Ocheechobee. Not going to happen though, so we continue. More later! My new "Best Friend Forever" mechanic and Captain Wes Malone is shown here after finishing a particurlarly challenging filter R and R. Wes is a great guy. Honest, dependable and a genuinely nice person. After a couple of hours of hard work we were underway departing Halifax Harbour Marina, one of the finest municipal marinas on the East coast of FL. Another back story to Halifax Harbor Marina is that it is the location of the Broker and Broker's rep that I bought the boat from, Bill Eve of Yacht Brokers at Halifax Harbour Marina. Bill is also a fantastic guy and ironically, completely by chance (or maybe not if you are a person of faith), Bill was the child of Missionaries, like Candy and Dusty, and had attended the same boarding school for the children of Missionaries and Preachers Kids and the like, Taccoa Falls Institute, later Toccoa Falls Academy in Taccoa, Ga, that Candy attended a couple of years. Bill attended years earlier than Candy but the connection seems more than a coincidence, doesn't it? Well, here is "the rest of the story" as Paul Harvey would say. We bought BossSea through Bill who was fantastic to deal with as was the company. If you ever want to buy or sell a boat I would highly recommend these folks. Bill stopped by the boat and chatted awhile as Wes was working away (Bill had introduced us to Wes who is also a Captain who came to check us out in the boat over in Sanford back in early June after our purchase.) Again, coincidence, right? I don't think so. Unfortunately, I forgot to take a picture of Bill. Sorry Bill! Next time for sure. To follow is our parting shot fro Halifax Harbour Marina. We look forward to another visit. 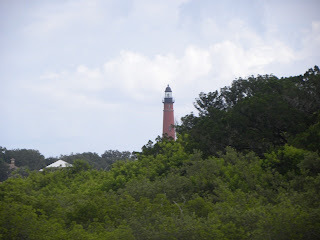 Proceeding down the Intracoastal we passed Ponce Inlet with the beautiful lighthouse as shown here. 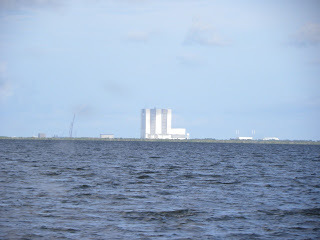 Trouble followed however when we got to the railroad that goes over to Cape Canaveral. It is closed for all but two hours per day. Now we wait til 5pm! More later! Hopefully we make Cocoa but it is not looking good!